Say what you want about Marvel but their marketing and writing teams know how to make headlines and set the internet on fire. After weeks of speculation and hot on the heels of the announced Female Thor ongoing series comes the official announcement that Samuel Wilson, long time partner of Steve Rogers who took the world by Storm in the blockbuster Captain America and the Winter Soldier will (Once again) be taking up the mantle of Captain America. The more interesting details for us is that Sam Wilson will not just sport the Red, white and blue costume but keep his signature wings for flight. Ok, Marvel you win. I’m curious and intrigued enough to give you my money especially with DC Comics cancelling Batwing and not announcing a single black ongoing series. Clearly they DONT want my money! This coupled with the new Deathlok series means Marvel continues to be the leading mainstream voice in Black superheroics! 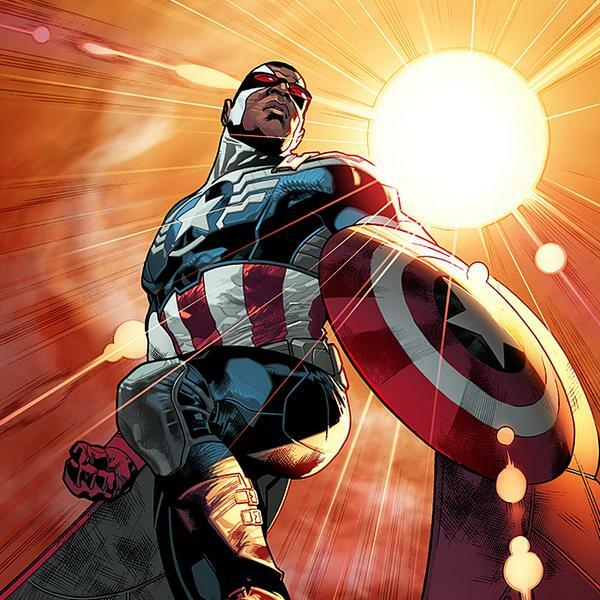 This move not only makes Samuel Wilson the first African American Superhero but also the first black Captain America to have an ongoing series. Everyone else has had miniseries or been part of an ensemble book. Hopefully this move also gives Samuel the respect and much needed bump in his public image, notoriety and respect. ~LEARN EVERYTHING ABOUT THE ALL NEW CAPTAIN AMERICA HERE~! Learn more about the other black Captain Americas below! But the actual stories they have recently told about my fave characters do not leave me with a good feeling about what is to come. I guess we just have to wait and see . I come here to get away from them. Yeah I hear you.lol Sometimes you want to get away from the crazy trolls. Some can be relentless at times. It’s a welcome change, but these recent developments Marvel are making feel a bit pointless to me. Don’t get me wrong, Falcon as Cap with wings sounds wicked (him being significantly weaker doesn’t) and a female Thor will undoubtedly be great, but if Marvel really want to cover all grounds, why don’t they just make an original black or female character better than any one they’ve made yet, and push the character as much as they push their larger properties to really make them a staple hero (or villain) in the marvel universe. Re-using the same popular heroes but changing their race or gender is thoughtful idea, but an old technique that they’ve done before, which isn’t a great one either. 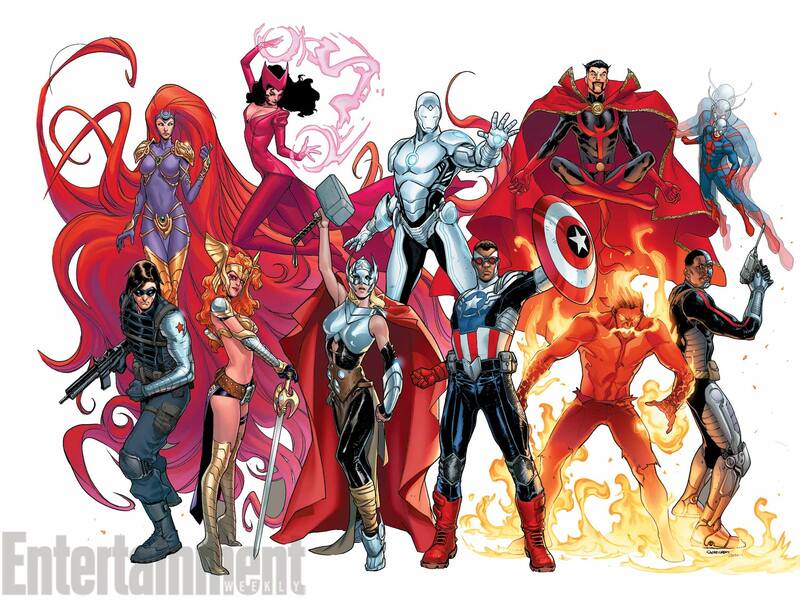 That’s Inferno star of the Inhuman title from Marvel. Makes sense. In one regard i like it because he’s black. But that they’re not boosting his natural abilities with an updated version of the super soldier serum, i do not like. This subtle of obsession with white comicbook writers, to “Robin-ize black character even in power levels is so tiring. Even from common logic, it would make absolutely no sense to pass on the mantle of cap to anyone whose going to be LESS powerful than the original. If anything, by virtue of this advanced era of science and medicine he would be given a serum to make him more durable than Steve Rogers. It’s been established from WAY back that they can’t duplicate the supersoldier serum. The formula went with Dr. Erksine to his grave. I was also sold when they talk about how Sam has the same views as Steve but from a different view. I would rather they gave Sam a big push because of the popularity of the movie and let him succeed on his own merits rather than slapping the name Captain America on him. Lame. This shouldn’t be news. Hell, it shouldn’t have happened. Yet another gimmick to get tongues wagging. This isn’t permanent. This is a marketing ploy (made worse because it was done at the expense of a great black character in The Falcon. How REFRESHING would it have been if The Falcon was given his own title with the best creative team they could find and a marketing effort to get him in the minds of the public? How refreshing would it have been to see Marvel Comics build on the strength of CA:TWS and try to make Falcon as popular as they could? A Black Panther movie would be nice right about now, right? Sam Wilson will be Captain America for roughly a year or so. Then, when its time to ramp up EXCITEMENT (and sales) again, Steve Rogers will return (probably just in time for the 3rd Cap movie). Captain America has been many things. He has been black before. Big whoop…. Are black comic book fans so starved for ‘black heroes’ that they are blind to the obvious ploys used by a publisher that is without a doubt totally devoid of ideas? Mr Perrin, I totally agree with your statement. Agreed. I think in the mind of white writers they honestly think they’re “throwing a bone” to black comic book characters qhen they give them white superhero hand-me-downs a la the john stewart character of dc comics. It ticks me off they are messing with the first african american superhero’s legacy. Hey marvel why not make luke cage the new falcon since u created a new younger powerman character and are playing musical chairs with the black superhero legacy: we all know its ONLY to bring further props to the steve rogers character somewhere down the line. in 2003 with Marvel’s – Red, White & Black. Note to Disney : It was dumb 11 years ago too. I believe you are referring to the Kyle Baker story. I must say that I did very much enjoy the last part of the story. And on the subject on the new Black Captain America I believe the Sam Wilson character and all the ‘ethnic Avengers” are being set for a fall . 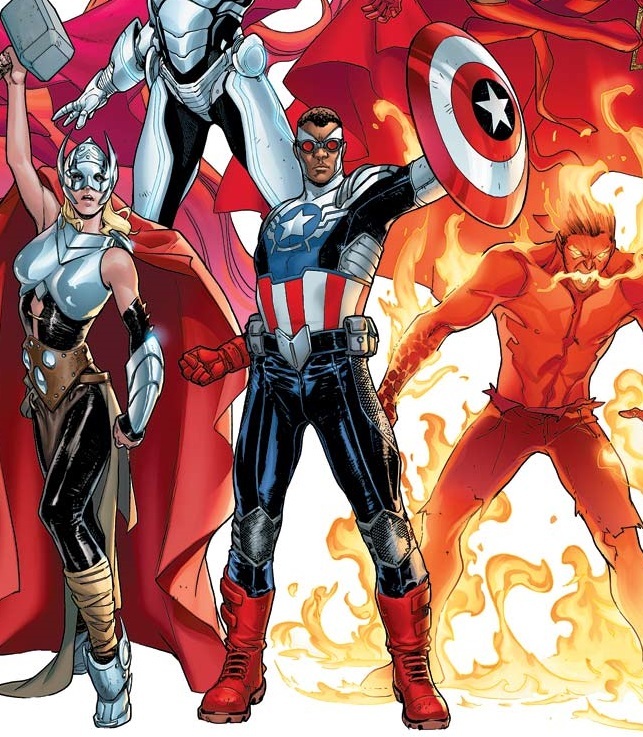 The Preview catalog tell us that that Marvel is about to embark on a “Villains Triumph ” mega arc( similar to what D C has done ) in which the Red Skull defeats all the heroes and takes over . So I speculate that Sam Wilson will takes up the mantle just in time to lose and lead the team into defeat . I further speculate that this situation will persist for a bout a year and then Marvel will resurrect( the soon to die ) Wolverine and re power Steve Rodgers and maybe even bring back Professor X and together the white men will save the world. IMO, I think Marvel should capitolize on the Black characters they have now (Luke Cage, Tachalla/Black Panther, etc.) than to make Falcon the new Captain America or make Johnny Storm Black. Shoot, how are you going to blow up vibrainium(sp) in all the Marvel movies and not mention anything on Wakanda or The Black Panther? They’ve been talking about a BP movie since Forever. I wish Wesley Snipes would’ve moved forward with the movie before he went to jail. IMO, Falcon becoming Captain America actually makes sense and isn’t just another lame race swap like some of the others. Sam has been Steve’s right hand man for a while so the idea of a guy asking his friend to take over for him isn’t that far fetched. And lets be honest, Sam is more than qualified to take on that role and isn’t some nobody getting shoehorned into the role. But don’t get me wrong I’m also a lobbyist for other black heroes getting their much deserved time to shine. I’m afraid that a BP movie is gonna be nothing more than just talk, looking at how that’s all they’ve done while busy getting everybody else movie off the ground. I also kinda wish Wesley would’ve made his BP movie, but at the same time I’m kind of glad he didn’t cause the quality of comic movies has greatly improved since back then and I really want BP to be apart of this current superhero craze cause the number of new fans has grown thanks to the movies and I have no doubt that BP’s popularity is gonna skyrocket once he gets the well made movie he so richly deserves.